It is well established that economic inequality has grown in most OECD countries over the past 30 years (see e.g. OECD, 2013; Piketty, 2014). This rise in inequality is the reason that several Nobel laureate economists made a call for more progressive taxation (Shiller, 2012; Stiglitz, 2012; Solow, 2014). Our study shows that these calls are justified on the ground that rising income inequality and wealth concentration contributed to both the financial crisis of 2007-09 and the sovereign debt crisis in the Euro area in complex but essential ways. Rising income inequality can be expected to lead to stagnant global aggregate demand because the global economy is in a wage-led demand regime (Onaran and Galanis, 2013). Prior to the crisis a potential demand problem was circumvented by a debt-led growth model in countries like the US, UK, Greece, Ireland, Portugal and Spain, and a mercantilist export-led growth model in countries like Germany, Austria and Japan. To be more precise, stagnant real wages in working class households meant that the latter group of countries mainly relied on increasing export surpluses to grow, whereas the consumption led growth in debt-led economies was financed by household borrowing. These two growth regimes were interdependent. The rising consumption expenditure in debt-led countries enabled the growth of current account surpluses in export-led countries and fostered at the same time capital flows to debt-led countries. These capital inflows contributed to a rise of asset prices in debt-led countries, which were important to enable households in debt-led countries to increase their borrowing (see Figure 1). The outcome was that both growth regimes relied on each other but also that both were intrinsically unstable because they were contributing to significant balance of payment balance imbalances and the over-indebtedness of households in debt-led countries. 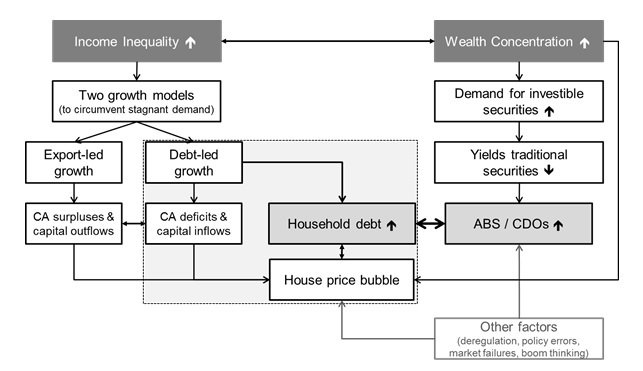 The finance for the debt-led growth model was also provided by rising wealth concentration. Between 2002 and 2007 net millionaires – so called high net worth individuals (HNWIs) – increased their global wealth holdings from around US$ 26.7 trillion to US$ 40.7 trillion. The resulting increase in financial asset demand contributed to the lowering of AAA-rated bond yields, which, in turn, led to a ‘search for yield’ by global investors (Goda and Lysandrou; 2014) and thus fostered the rising demand for asset backed securities (ABS) and collateralized debt obligations (CDOs) (see Figure 1). The growth of the CDO market was mainly driven by hedge fund industry (Blundell-Wignall, 2007). The major involvement of hedge funds in the CDO market can be explained by the pressure that they faced to generate above average returns for their clients. To ensure high returns hedge funds rely on leverage, and to keep borrowing costs low they need investment grade securities as collateral. Given the low yields of traditional fixed income securities and their growing asset base (between 2002 and 2007 hedge funds’ assets under management increased from US$ 600 billion to US$2.2 trillion), hedge funds increasingly bought investment grade tranches of CDOs because these provided higher returns than investment grade bonds and could be used equally well as collateral. An important reason behind the growth of the hedge fund industry was increasing wealth concentration: the investment of HNWIs in hedge funds increased from around US$ 500 billion in 2002 to US$ 1.1 trillion in 2007 (Goda and Lysandrou; 2014). HNWIs thus contributed in two essential ways to the financial crisis: (i) they helped to foster the ‘search for yield’ phenomena that contributed to the growth of the structured credit market in the US, and (ii) they were the main investor in hedge funds who were the main buyer of CDOs. One outcome of the financial crisis was that European governments needed to rescue two types of financial institutions: (i) those institutions that bought the toxic securities that triggered the subprime crisis, and (ii) those institutions that had a maturity mismatch and could not roll-over their debt. Another outcome of the financial crisis was a credit crunch that led to the Great Recession of 2009. The recession, in turn, meant that governments in Europe had to increase their (social) expenditures while their revenues declined at the same time. Accordingly, public deficits and debt-to-GDP ratios increased in nearly all Euro area countries (Figure 2a). During the financial crisis and great recession long-term government bond yields of Euro area countries declined or stayed roughly stable due to a global flight to safety by investors (Figure 2b-c). But this situation began to change in 2010 when investors became concerned about the sustainability of the public finances of those peripheral Euro area countries that had significant current account deficits – namely, Greece, Ireland, Portugal and Spain, the so called GIPS countries. Hence, GIPS countries experienced a sharp rise in their government bond yields after 2010 (Figure 2b-c). Their interest rate hikes made a bailout program from the European Commission, the European Central Bank (ECB) and the IMF necessary because the refinancing costs for GIPS countries became too high. One condition for the bailout was austerity measures, which led to a drastic decrease in domestic demand, a sharp increase in unemployment, social unrest, and a long economic depression (Figure 2d). 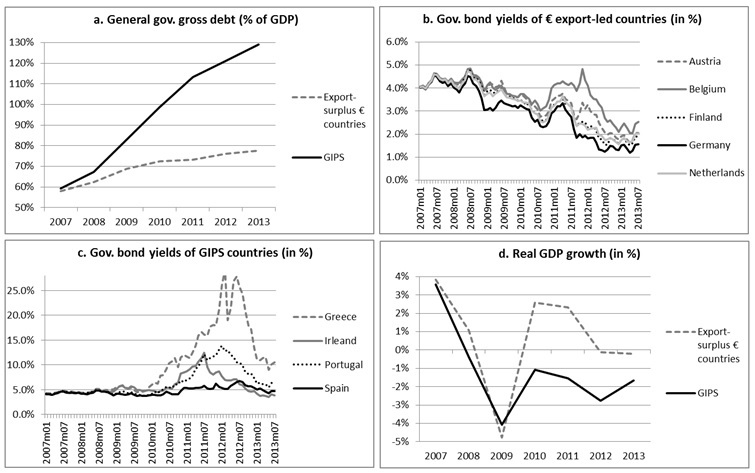 The outcome of these developments was that the debt-to-GDP ratios in GIPS countries were not declining but instead were increasing further (Figure 2a). Euro area countries with current account surpluses were also hit hard by the recession but they recovered quickly (Figure 2d). However, this recovery was short lived, given that roughly two thirds of Euro area exports are within the currency union. Accordingly, today all Euro area countries are experiencing either stagnating or negative growth. This analysis shows that the main cause for the Euro area crisis was the financial crisis and the deepening of current account imbalances within the region and not so much the lack of fiscal discipline by some countries, as argued by many economists and politicians. Note: The export surplus countries are Germany, Austria, Netherlands, Belgium and Finland (sources: IMF, WEO, IMF, IFS). An important policy implication arising out of this analysis is that redistributional policies are necessary on a global scale. Such progressive policies should not only include more progressive taxation but also the restoration of the link between productivity and real wage growth and a stronger government engagement in social policies. These changes can be expected to foster aggregate consumption demand and to diminish the demand for risky financial products at the same time. Redistributional policies would therefore lead to a more stable and inclusive global growth regime with (i) more profitable long-term investment opportunities in the real sector, (ii) more employment, and (iii) less financial fragility. Unfortunately, such government policies are not high on the global policy agenda at the moment. Thomas Goda: Universidad EAFIT, School of Economics and Finance, Medellin, Colombia (tgoda@eafit.edu.co). See Thomas Goda, Özlem Onaran, and Engelbert Stockhammer (2014). “A case for redistribution? Income inequality and wealth concentration in the recent crisis". CIEF Working Paper, No. 14-17, Universidad EAFIT.